The critically acclaimed and prize winning international opera tenor, Christopher Bengochea, is quickly being sought after by opera houses, concert venues, and audiences alike. Mr. Bengochea has been heralded as having “power, sure intonation, and fine diction that come in a package tied with a ribbon of ‘natural sound’ tenor.” Christopher Bengochea has delighted audiences with his unique combination of vocal and dramatic interpretations in performances ranging from oratorio to opera. Hope Briggs drew a rave review from Opera News for her San Francisco Opera debut as the Duchess of Parma in Busoni’s Docktor Faust. “…Hope Briggs was stellar, delivering one of the evening’s highlights with her lusciously intoned, lovelorn aria.” As a critically acclaimed Verdi soprano, Ms. Briggs is known for the depth and beauty of her voluptuous voice. As an active performer in the Bay Area, Chun Mei Wilson has appeared with artists in St. Mary’s Cathedral in San Francisco, Bruns Amphitheater in Orinda, UC Berkeley and Stanford University. She accompanies for Festival Opera, Livermore Valley Opera, and Solo Opera. This event is open to all Rossmoor residents and their guests. Seating will be auditorium style. Refreshments of wine, non-alcoholic beverages and finger food will be served at intermission. Tickets are $15.00 and will be sold at the Event Center lobby from Thursday, April 4 to Thursday, April 11 (except Sunday, April 7) from 11 a.m. to 1 p.m. If tickets are still available on the day of the performance, they will be sold from 5-7 p.m. and will cost $20. Tickets may be ordered in advance until April 8. 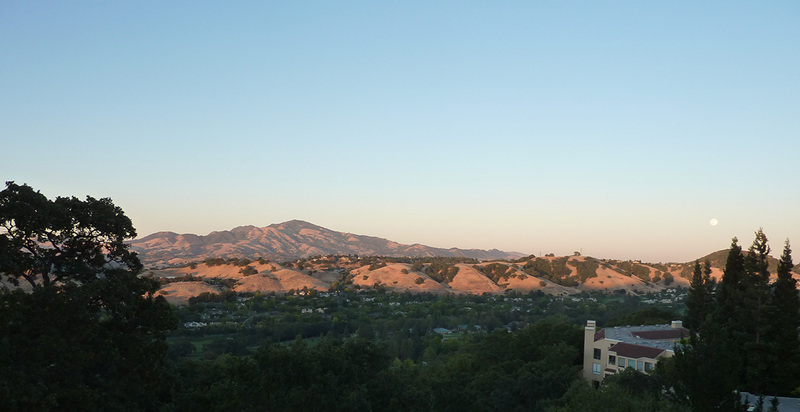 Send a stamped self-addressed envelope and a check payable to the Italian-American Club to Joe Casalaina, 2650 Saklan Indian Drive, Apt 4, Entry 12, Walnut Creek, CA 94595. 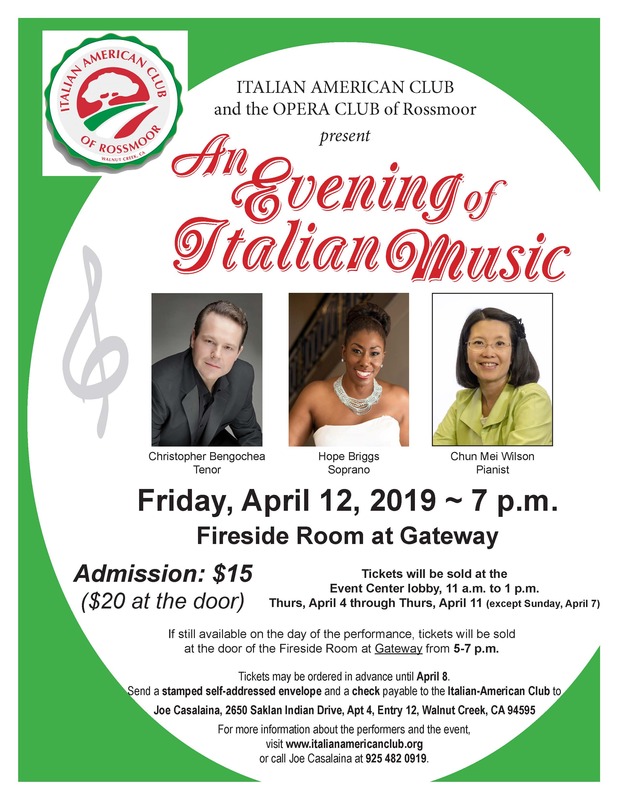 For more information about the performers and the event, visit www.italianamericanclub.org or call Joe Casalaina at 925 482 0919.